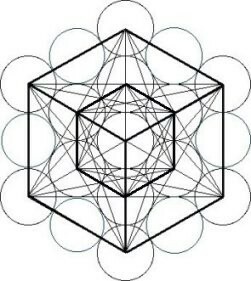 The square (in 2D) which is an 8×8 energy grid became a 9×9 energy grid which is manifest / gross. The transition forms were an octagon and a circle. Aintiram suggests how this transition takes place. Present physics accepts that a pulse and a sine wave can be created from each other and this happens because of simple addition of harmonic frequencies. The primordial pulsation initiates a rotational force and this rotational force as it gains momentum converts the square into a circle and if you notice that the octagon is just an in between state between a square and a circle. What it suggests is that the essential shape of every gross form in its natural state is a circle (in 2D) and a sphere in (3D). This is the reason we find every planetary body is almost spherical in shape and this is also the reason as to why the ripples in a water body when we throw a stone in the water are in circles. Be it the center of a tornado or the shape of a hurricane or a tsunami it always a circular force. The supreme secret in martial arts is that the Chi moves in a circular fashion and hence Tai Chi is the most deadly form of martial arts. Lord Vishnu has Chakra as his weapon to suggest not only light but also the rotational force. The process of manifestation is captured in these 2 pictures at all the significant stages. If you notice that a single dot becomes multiple dots, then a line, then a pulse and then goes on to becoming a 8×8 energy grid and then to a 9×9 energy grid. 8×8 is un‐manifest and 9×9 is manifest. These aspects are very well captured as sutras in the book Aintiram and Pranava Vedam. Subtle Energy becomes gross universe and the fundamental 5 elements are created in the process. It is said that 1/10th of the space becomes Air, 1/10th of air becomes Fire, 1/10th Fire becomes Water and 1/10th of Water becomes Earth. So we can conclude that we are living in a Space delineated world. 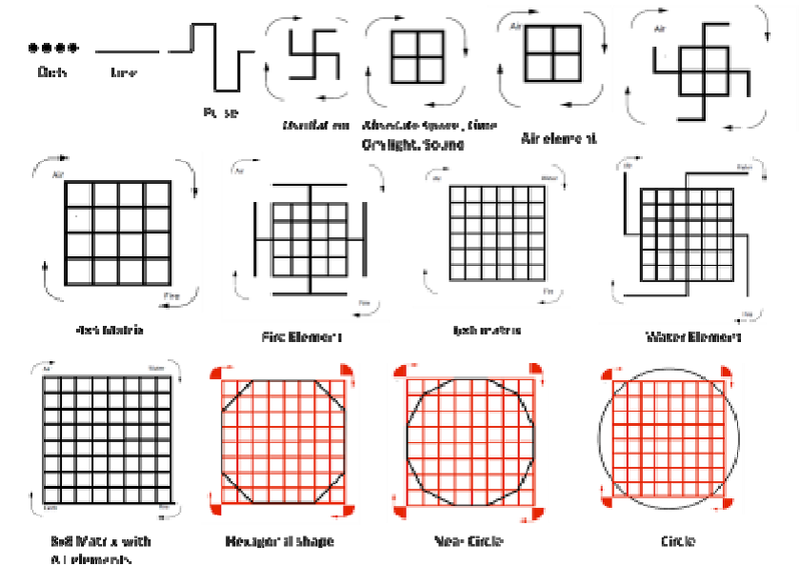 Vastureva Vaastu – Vastu which is unmanifest and subtle becomes Vaastu which is manifest and gross. If we assume that Paramaanu is God particle and hence it is divine, then everything in this world is divine. See the oneness in all and see “All in one”. All beings in the universe are divine. There is nothing without that divine energy or particle – however we call it. This is Universal, Open source, All Compassing and the highest state of Consciousness. We all note that Subtle has become Gross. Hence conceptually Gross = Subtle or both are proportionate. We all note that Space has become Earth. Hence conceptually Space = Earth or both are proportionate. We all note that 8 have become 9. Hence conceptually 8 =9 or both are proportionate. We all note that ENERGY has become MATTER. Hence conceptually ENERGY = MATTER or both are proportionate. This is represented by E = mc2 by our great scientist Einstein. While we did not have this specific formula, the concept and the associated texts were very much with us for ages. Now let’s try to answer this question. When you throw a stone in water / pond the ripples that form take the shape of a circle (in 2D) / sphere (in 3D). Can you guess what the shape of the ripple would be if you throw the same stone in space? You would have probably guessed the answer. The ripples in space should be and would be in square /cube in shape. Mamuni Mayan, having impeccably known the subtle principles of the science of manifestation, sets forth this cosmic balance maintained between sound-forms and light-forms. In Aintiram, the Key-work of Mayan, one of the Sutras reads: “Oli-Oli vadivaay ongum elutte.” Peripherally this means: “Letter is ever rising and functioning in the form of both light and sound.” But apart from this peripheral meaning, we could observe the multiple dimensions of meaning as radiating from the sutra. The main source of such radiation of multiple meanings is the term ‘eluttu’. ‘Eluttu’ is derived from the word ‘elu’ meaning ‘the creative urge’, ‘excited to manifest’, ‘operative stir’. As such, the different meanings of the term ‘eluttu’ as conceived by Mayan are – letter/phoneme, pranava – the primal letter, the inexhaustible cosmic stuff, the imperishable existence (akshara), square mandala, sculptured object and so forth. This is how the actual subtle form of ‘a’ appears. 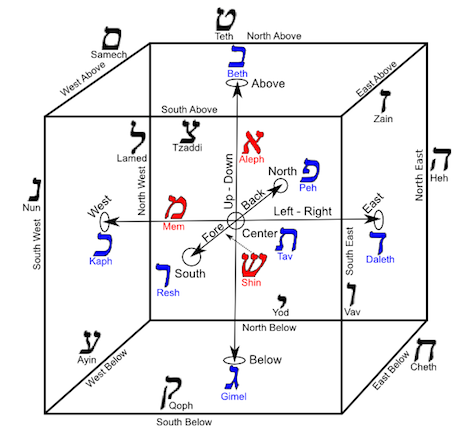 Similarly, all other letters from ‘a’, ‘i’, etc, have their own subtle forms constituted by many other saktis. Since all the letters are charged with and energized by different potencies, they function as the creative and regulating powers of the universe. They are not inert letters. Actually there is no such letter as marred with inertness. Every word or letter is derived from the Divine-I-Consciousness, which is with constant creative urge expressed by its ever-going ‘spanda’ or ‘throb’. This consciousness is called ‘the Supreme Verbum (paraa vaak). Hope you have learned a lot on Vastu Science & Vaastu Technology and more than that about life, creation and manifestation from the Source through the book “Fabric of The Universe: The Origins, Implications, and Applications of Vastu Science” by Jessie J. Mercay. It reveals and illuminates the mechanisms of creation from intangible Absolute Space through the weaving of the fabric of creation to the emergence of the material world. The word Brahman as used in this text is both scientific and spiritual. 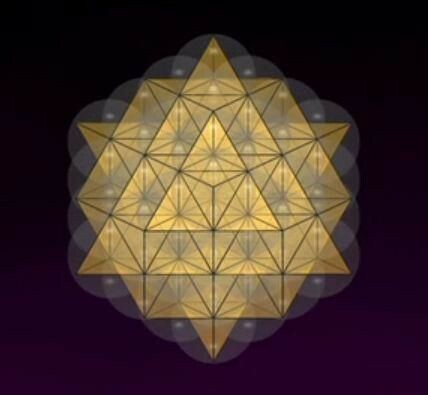 It is an ancient name for the Quantum field – the source of all life. This book answers our fundamental questions about that source of life. How does unmanifest, potential energy become manifest, material form? How do the buildings we live and work in influence our emotional & physical health and spiritual & material prosperity? 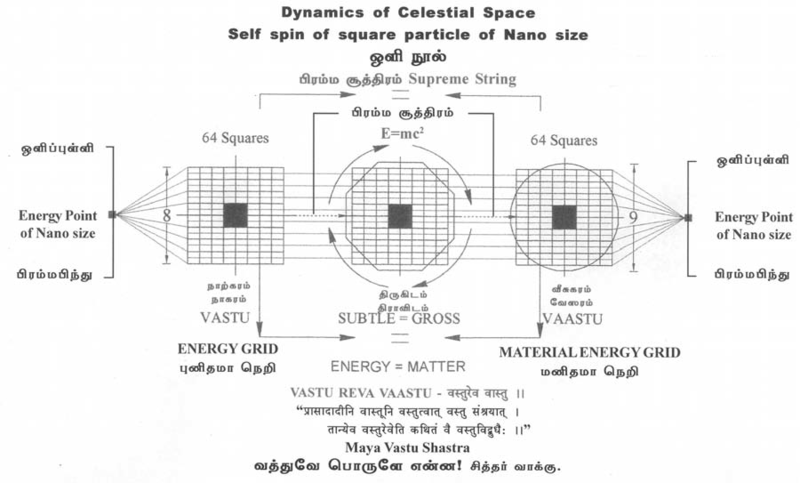 The fundamental crux of Vastu Science and Vaastu Science and Technology is that Mayan, an ancient architect and Rishi perceived that there is one force, one fundamental First Principle from which all life emerges, and in which all life resides and ultimately returns to its Primal state of pure energy. He named this principle Brahmam. He saw that Brahmam, (Absolute Space, Consciousness, Potential Energy) by its own initiative, goes through a specific process to transform and manifest itself as the material world and its objects, Kinetic Energy. Mayan perceived that process was accomplished through a mathematical order and that order could be replicated by humans to unfold specific qualities of Brahmam that would vibrate in a form that brought health, happiness and spiritual bliss to those who partook in that form. That form could be dance, poetry, music, sculpture, or architecture. Not shown but implied is the 8×8 grid behind the octagon and circle. Octagon and circle are simply transformations of the 8×8 grid. Unmanifest Absolute Space – Consciousness – Brahmam transforms itself into manifest Consciousness – Brahmam in forms such as trees, rocks, people etc. 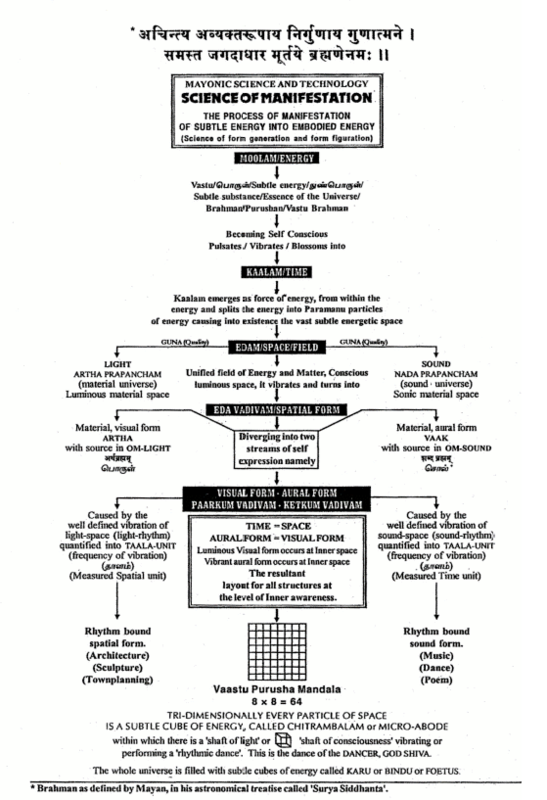 The universal laws and building codes of authentic Vaastu Shastra (Mayonic Science) reveal, in profound detail, how to create built space using the precise mathematical formulas, inherent in all creative activities, which take place in nature. A Vaastu structure is a vibrant, self-contained living organism, which serves to enhance positive qualities of life for its inhabitants. Through many readings and deep study, if you choose this path of Mayonic Science and Technology, you will ultimately learn that health, wellbeing and spiritual bliss can be found right at your own. 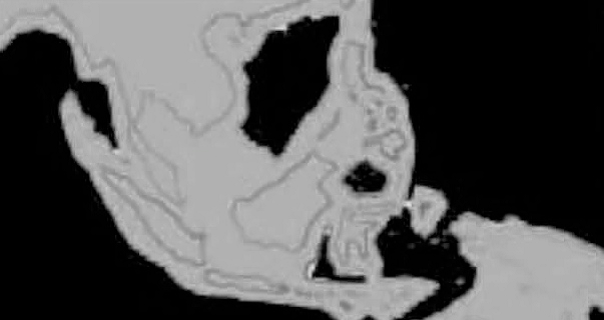 The map to given below is a close up of what Kumari Continent might have looked like before the global warming. The grey lines are what is now the shoreline of Indonesia, Philippines and the countries that currently exist as island continents and the Asian continent and countries in the ocean. It is estimated that this landmass that united what is today Western Indonesia and the Philippines with mainland South East Asia, China, and Australia was over 1.7 million square kilometers in size. This enormous land mass had a large inland fresh water sea and apparently several smaller ones that might have supported a human population of millions. Kumaria was a 16 continent that existed for well over 30,000 years. This fact is substantiated by the changes in the ocean depths that remained low during that time – which, since then has risen 400 feet. The big thaw and the rapidly rising sea levels reduced Kumaria from 1.7 million square kilometers to less than 1 million square kilometers and increased coastlines more than threefold. The interior of Kumaria and the coastal areas where the heaviest concentrations of human population were located simply vanished beneath the sea. Traces of these ancient civilizations are being found off the coast of India, Japan, and other areas around the world. melting icecaps and related monsoons around 11,600 – 12,000 years ago. These pottery containers were closed containers in which vegetables and fish could be steamed. This concept of steaming food is a relatively advanced concept as are the pottery containers. Many stories of a lost continent and a lost civilization can be found in the folklore and writings of the ancient people. In Timaeus and Critias, Plato wrote the story of Atlantis a lost civilization that sank beneath the oceans. Ancient legends around the world tell of a great flood that swept the world thousands of years ago. Modern science has shown through the analysis of the earth’s ice caps and ocean levels that the earth experienced a great flood of cataclysmic proportions during 11,000 – 10,000 BC. Current archaeological theories state that before 10,000 BC no early human civilizations developed agriculture or built great empires. Modern archaeology further states that during the Paleolithic age humans were hunters and gathers that lived a subsistence level comparable to the Neanderthal man. Ancient literature of Tamil Nadu states differently. Contrary to general thought, according to these texts, a highly developed civilization existed during the ice age periods in the equatorial belt on Kumari Continent and in other places around the globe. The existence of music and musical instruments is a sign of a somewhat advanced culture. In China, the Institute of Cultural Relics and Archaeology of Henan Province, Zhengzhou, Henan, China holds a number of ancient flutes carbon dated to be over 9000 years old. 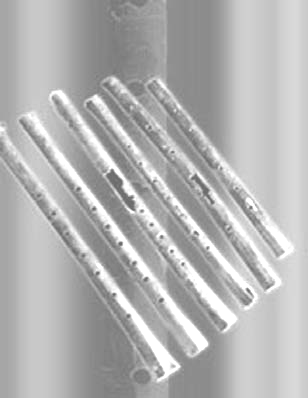 These flutes are tuned very closely to modern pitch and have been exactly replicated to playable instruments. In the Indus Valley numerous sophisticated carpenters tools were found as well as advanced indoor water systems and architectural forms. These date as far back as 9000 B.C. The civilizations of that day were not as primitive in some parts of the world as previously thought. As mentioned earlier, ancient Tamil texts say that there was a great migration from Kumari Continent far and wide around the globe between 10000 and 11000 B.C. due to its being engulfed by the rising oceans. Certainly the sophistication of that society provided the means for such a mass migration. One of the individuals who migrated to the Indian mainland was an enlightened sage named Brahmarishi Mayan. It is this Rishi who cognized the Science and Art that is the subject of this book.